When you’re shopping for a designer watch, you might not expect much from a company that made their fortune designing shoes. 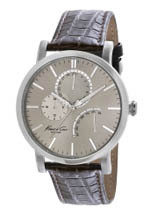 When it comes to Kenneth Cole watches, you’d be wrong. Yes, the company was founded in 1982 as a shoe manufacturer, but they’ve since branched out into a sizable fashion house that produces clothing, shoes and accessories for both men and women. The line of Kenneth Cole watches is surprisingly diverse, offering nearly 250 different models, almost equally divided between men’s and women’s models. 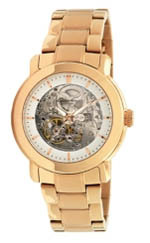 Kenneth Cole watches are well made, reasonably priced, and come with one of the best warranties in the industry. It’s hard to go wrong with that combination, and it’s pretty likely that the company will have at least one timepiece in their product line that you’ll love. Read on for the full Kenneth Cole watches review. 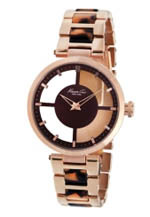 Keep in mind that Kenneth Cole watches are designed and sold by a company whose primary business is not watchmaking. Their timepieces are listed as “imported” on their Website, but we’ve determined that they’re made using accurate Japanese made quartz and automatic movements. Water resistance is moderate, at 30 to 50 meters for most models, but these are largely fashion timepieces and not sports models. Cases are stainless steel, with bands of either stainless steel, leather, or silicone, depending on the model. Almost all models use high quality, highly accurate Japanese made quartz movements. A few limited edition models have automatic mechanical movements, but these are the exception. These timepieces will require relatively little maintenance. As the company is primarily concerned with fashion, you won’t be surprised to see that this brand doesn’t display any real “in house” technical innovation. That’s not what the company does; they’re interested in creating functional, attractive timepieces. Their models use time-tested features that have been developed elsewhere so they can focus on their primary area of interest and expertise – design. Design is where this brand really stands out. The company makes more than 100 models each for both men and women, and their designs range from sporty to traditional to pretty daring. Their displays are all analog, but they have some models with chronograph features and others with skeleton displays. They’ve got traditional, business-style models that wouldn’t look out of place in the mid 1950s and modern, cutting-edge designs that will attract attention anywhere. They don’t offer a lot of color; their product line features mostly silver, gold, black and white, with a couple of blue models thrown in. Bright reds, purples, pinks and greens aren’t something you’re likely to find. Styles include models for daily casual wear, business wear, and formal evening wear, though you’re not going to see real diamonds or genuine gold cases at the company’s price points. That said, Kenneth Cole watches offer a tremendous variety of style, and it should be easy for anyone to find something they like in the product line. As these watches feature highly accurate Japanese quartz movements, they’re relatively maintenance free. You’ll need to replace the battery every two years or so and make a point of keeping your watch away from extremes of temperature, strong magnetic fields and caustic chemicals. You’ll want to store it in a cool, dry place. If you have one of their few models with an automatic movement, you’ll want to either wear it regularly or store it in a watch winder to keep it working properly. Aside from that, you’ll find that these watches don’t make many demands on you in terms of care. The warranty is one of the best in the industry. Despite their relatively low price point, they offer an unlimited lifetime warranty against defects in materials and craftsmanship. That’s exceptional for any brand, but it’s truly amazing for a company that offers designer wristwatches that are relatively inexpensive. The average warranty we’ve seen, even among super expensive brands, is about two years. The exceptional warranty makes these watches a good buy. As designer timepieces go, these watches are quite affordably priced. Both men’s and women’s models start at less than $100, and the prices top out at a reasonable $250 or so. Compared with other designer brands, this qualifies them as inexpensive, and at the prices their offering, combined with their terrific warranty, chances are you’ll want to buy more than one. There doesn’t seem to be any collector interest at the moment, so don’t expect your purchase to appreciate in value over time or become a valuable collector’s item. Just expect it to look good and work well for years to come. You can find this brand for sale at high end department stores and certainly at any retailer that sells any of the company’s fashion products. You may find them for sale at jewelry stores, and you can also find them for sale at a number of outlets online. Keep in mind that the product line is pretty large and diverse, so it’s unlikely that any single retailer is going to carry everything the company offers for sale. You might have to shop around a bit if you’re looking for a particular model. If you’re shopping for a designer wristwatch and you’re either fashion conscious or are on a budget, it’s hard to go wrong with Kenneth Cole watches. They offer a tremendously diverse product line with several hundred different models from which to choose. They use high quality, low-maintenance Japanese-made quartz movements and stainless steel cases. 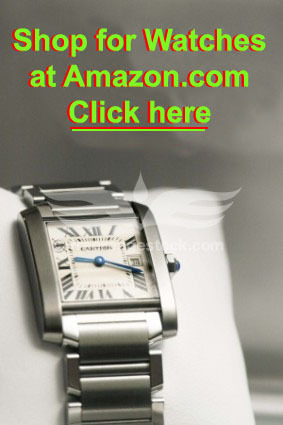 Their pricing is so reasonable that many shoppers will want to buy several of their watches to go with different outfits. Their warranty is one of the best in the industry and it assures buyers that when they buy Kenneth Cole watches, they’re buying something that is going to last a long time and work reliably for years to come. They’re a good buy, and we highly recommend them.